Travel Gifts for Father's Day will begin shortly. 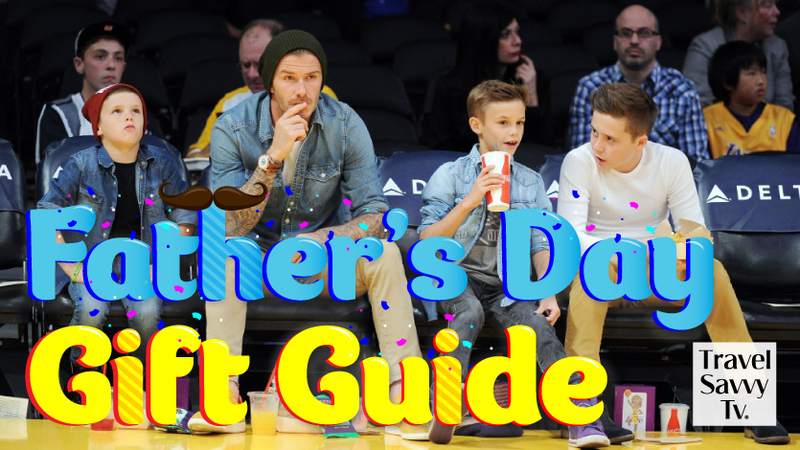 It's Gift Guide time! Today we'll show you 3 excellent travel gadgets that are perfect for Father’s Day. There are a ton of options today for smart-phone lenses that take your photography skills from basic to amazing, and they can cost anywhere from a few dollars to several hundred bucks. On the lower end of the scale is this $10 trio of lenses by Kikkerland, which include a macro lense for close-ups, a 180-degree fish eye and a wide angle lens which takes amazing landscapes. The compact, easy to use, lightweight lenses come with a clip attachment, and are a fun low-cost gift idea for anyone who wants to ramp up their instagram skills and snag more likes. In this video we also recommned the attachable smartphone lenses by Moment, the popular developer of phone camera lenses and mobile phone accessories which are designed to enhance your mobile photography results. One of their most popular items is their wide angle lens, which not only takes the most memorable landscapes you’ve ever seen, but now you’ll never have to cut anyone out of your group snaps--everyone will fit all the way across. Moment’s lenses fit onto your smartphone using their customized cover, which is a thin rubberized case that also protects your phone from drops and scratches. Because they work together, be sure to get both the lens AND the case for your gift recipient. Moment has given us a coupon code that you can use until June 30, 2018. Enter '#momentgear' at check out for 10% off your first order. Next up, gadget lovers never travel without a power pack, and there are tons on the market to choose from. For our money, we like the HubMax portable charging station by MyCharge, which works for tablets and smartphones. This unit features an integrated Apple® Lightning™ cable, micro-USB cable, and an integrated USB port. You can charge all your devices with one power pack, and you won’t muck up the bottom of your carry-on with a big tangle of extra cables and cords. Also, the power pack features built-in wall prongs for easy recharging of the unit itself. As for cost, it retails for $99.99. And finally, we just love the idea of gifting a great pair of noise cancelling headphones! Give Dad--or anyone who appreciates a little peace and quiet--the Bose QuietComfort 20 earbuds. Over-the-ear headphones are clunky and make it awkward to rest your head comfortably against the window shade when you’re trying to fall asleep, so we pack earbuds for every trip. As for wired vs wireless--Bose makes both versions. However, we like the wired QC 20s over Bose’s wireless ‘30s’ because the wired 20s still work as headphones when the noise cancelling system runs out of charge or when you’re being asked to power down all electronics at take off and landing; the QC30s do not. Cost: $249; select the correct QC20 headphones to fit your Apple device, or your Samsung or Android. That’s it for this week’s Wehear! Travel Savvy, and see you next time!